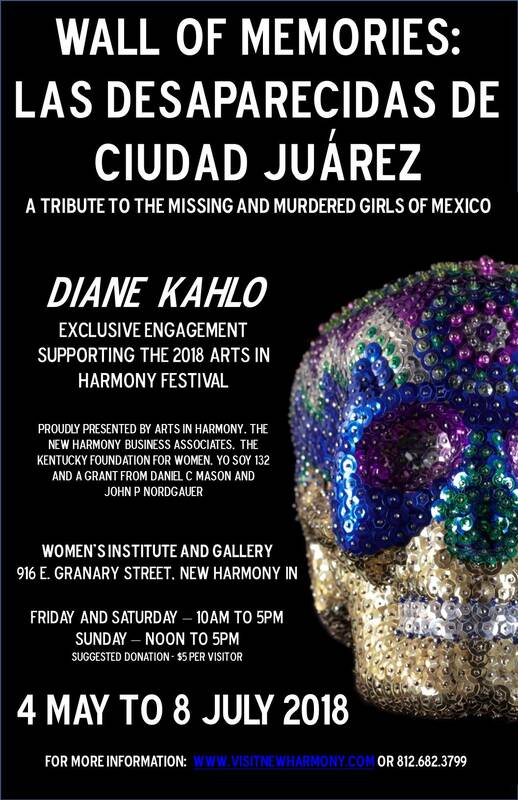 Please join us as we celebrate the opening of Diane Kahlo’s exhibit, “Wall of memories: Las Desaparecidas de Ciudad Juarez: A Tribute to the Missing and Murdered Girls of Mexico”. This incredible exhibit is presented by Arts in Harmony, the New Harmony Business Associates, the Kentucky Foundation for Women, Yo Soy 132 and a grant from Daniel C Mason and John P Nordgauer. The Opening Reception will be held on 5 May from 4 to 7pm central at the Women’s Institute and Gallery, 916 Granary St, New Harmony, IN 47631.